Recently developed & introduced by Impresstik Systems, Web-Master™ is a patented roll-changeover device that can be incorporated into Impresstik’s ‘in-line’ and ‘rotary’ label application machines. The concept enables automatic application of self-adhesive labels in the normal manner, but splices the start of the next roll in readiness for expiry of the first – thus avoiding any line-stoppage during changeover. 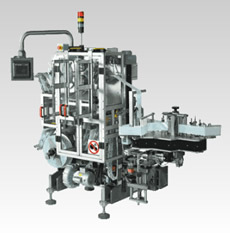 With automatic removal & disposal of the backing-paper waste after label application in addition to the ‘roll-changeover’ function, the Web-Master™ concept dramatically reduces down-time on the manufacturing line normally caused by manual label roll changes and backing-paper waste removal – and consequently minimises ‘labour’ requirements. Web-Master™ can be purchased either as a free-standing unit for integration into existing lines, or incorporated into new application machines.